One of the primary reasons I embarked upon my 2 year project in Savute, Botswana was to capture the rare behaviour of a fishing leopard. Four related leopards had been known to actively fish in the Savute channel, a river whih only started flowing in 2010 having been dry for 30 years. 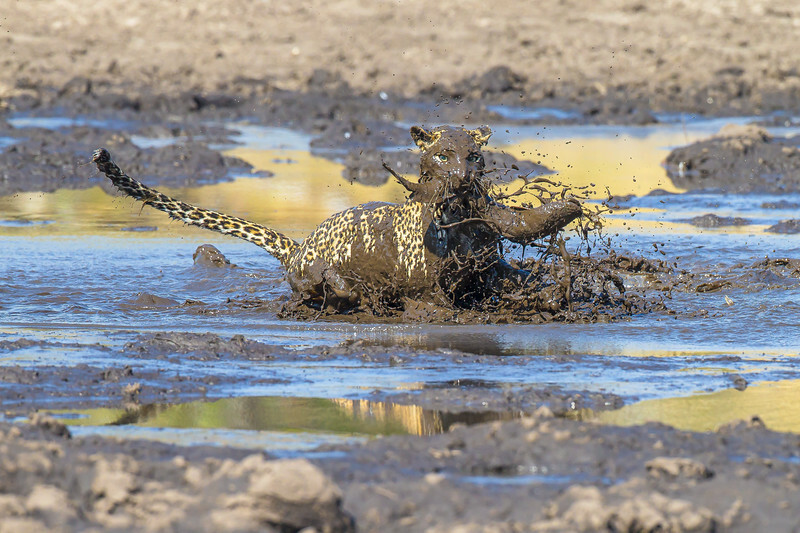 In 2013, when the water levels started to drop, the leopards discoverd the feast of catfish lying underneath but shortly afterwards, the annual flood arrived, rescuing the catfish and prompting one leopard in particular to learn how to fish in the flowing water, a feat only possible in precise conditions which occurred at night for just a couple of weeks a year. I converted a camera to infrared to try to captuire this nocturnal activity without disturbing the leopards but the necessary conditions never occurred again. When the channel finally dried into a handful of pools, the catfish were stranded and I spent many days over several weeks waiting by them hoping a leopard would come and take advantage. Eventually I was rewarded when this female, who was the most prodigious angler, arrived and plucked her writhing trophy from the murky water with ease.